(Newser) – In a strangely positive twist to climate change, a new study finds that Greenland could become a major exporter of sand as its glaciers disappear into the sea. As global temperatures rise, the island's vast ice sheet is rapidly melting away, and large amounts of sediments are being washed into the oceans, reports Reuters. Greenland's population of 56,000 could see significant economic boosts from mining the sand and gravel and exporting it to the rest of the world. "Greenland could benefit from the challenges brought by climate change," the team of scientists says. 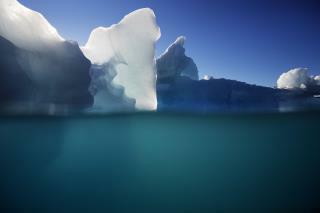 One described the melting ice sheet as a giant "tap that pours out sediment to the coast." The amount of sand delivered to the country's coast annually is estimated to be worth more than half Greenland's GDP, which is about $2.22 billion, and that worth is expected to double within the next quarter-century. Can you remember back far enough to remember when somebody in Arkansas started selling bottles of water. Everyone was laughing about that. Now bottled water is a major business enterprise. What next ? Maybe fresh air ? Somebody on here is going to tell me it is already being done. Join Donald Trump and many other sinister, malevolent, criminally-inclined, adulterous, lying rich people in an exciting opportunity to purchase soon-to-be beachfront property in Arizona! Soon the 'pink prison tents' of Ole Shurf Arpaio - which used to cover pesky, poor, non-white folks - will now be nestled on Arizona beach sand. Tracts of "There Is No Global Warming Estates" go for a measly half million per acre.